It’s the year 1764, the seven years’ war just ended, marking a new age for the British Empire and several other European great powers. The Age of Warring states ended in Japan and the clear winner was the Otomo Clan from the island of Kyushu. They won because of a clear technological advantage due to good relations with the Portuguese Empire. This victory marked a new golden age for the Japanese Empire, an age of technological innovation and a Japanese technological revolution. Japan became the most technologically advanced nation in East Asia. They amassed the biggest and strongest fleet the Pacific and Indian oceans have ever seen. They colonized Taiwan, Sakhalin, many Micronesian islands, the Philippines, most of today’s Indonesia and conquered Korea. The Japanese empire also converted to catholic Christianity and adopted Portuguese as its second language, due to an increasing amount in Portuguese influence and citizens. The Qing dynasty was controlling the most populous country in all of Asia: The Qing Empire. They experienced an increased amount of European interest in China and they accepted it. They accepted it to such an extent as to allow Europeans to occupy cities along the Chinese coastline to trade. In exchange they got access to European technologies. Due to Chinas immense industrial and military capabilities (Because of their massive population) they began to rapidly industrialize and were at the start of the 18th century the second strongest power in Asia. They started two wars against Japan, in an effort to become the dominant power in Asia. The first war (Spring 1745) was a total success for the Chinese army. They managed to conquer all of Korea in a matter of weeks, although their military wasn’t as advanced as the Japanese. They suffered medium to heavy casualties, just as the Japanese whom they outnumbered 2 to 1. After being confident in their military capabilities, the Chinese started a second war in the summer of 1746. The goal was, to capture Taiwan and sink the Japanese navy. On land the Chinese had the advantage. On sea, they didn’t. The Chinese landing party of 15.000 soldiers was sunk and three quarters of their navy (over 350 ships) were destroyed. The Japanese suffered minor casualties, losing three frigates and a ship of the line. 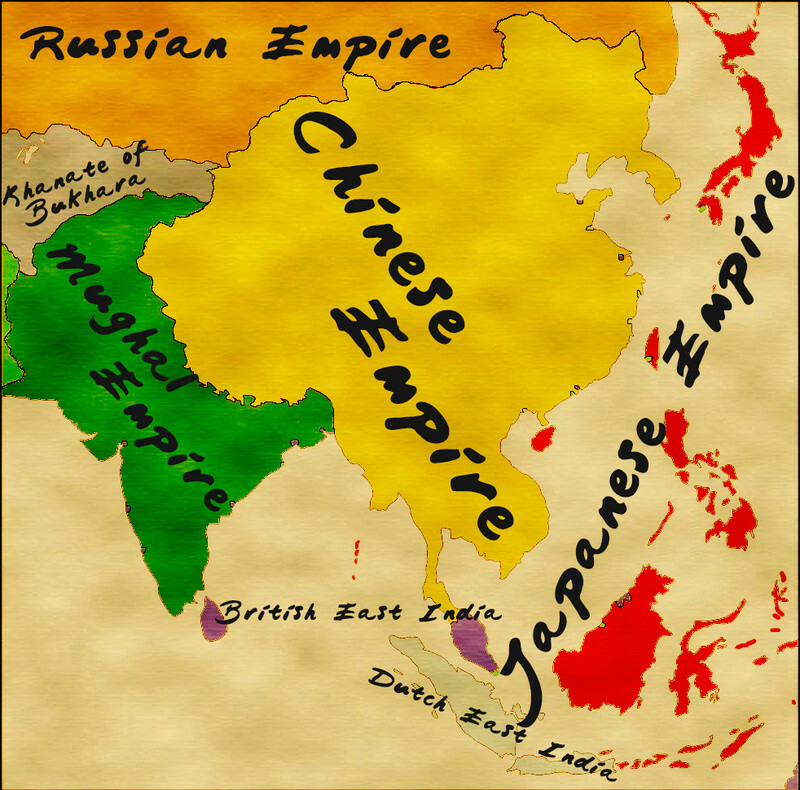 The whole war can be compared to the Russo-Japanese war of 1904. And so, the place for the most powerful nation in East Asia is still contested. Thanks for reading all of these scenarios and giving me feedback. I apologize for not releasing this for so long or rather halting production of this scenario. I apologize and hope you can understand my position. Very cool scenario. I agree that had both countries would be immensely powerful had they both westernized. I wonder how the Europeans would interact with the countries now they they could no longer exploit them and sign unequal treaties, especially in China's case. It might end up leading to both countries joining forces against the European powers continuing their colonialism. Mr Trolldemort wrote: Very cool scenario. I agree that had both countries would be immensely powerful had they both westernized. I wonder how the Europeans would interact with the countries now they they could no longer exploit them and sign unequal treaties, especially in China's case. It might end up leading to both countries joining forces against the European powers continuing their colonialism. Yeah, the Europeans wouldn't be too happy about this. Especially the british. Maybe I'll release a follow-up scenario to this one. But that's a HUGE maybe.